Boston, Mass. and Cranberry Twp., Pa.
"After spending time with Nick during the hiring process, it was evident that he was knowledgeable and well experienced in entertainment management. Additionally, his education proved to be one of the deciding factors in bringing him on board. Nick’s SAEM studies prepared him very well for the ever-challenging work that we do at the DLCC. His ability to multitask, and his understanding of the events and public assembly industry has accelerated his growth early on at the DLCC." "I believe that my SAEM classes were very helpful in helping me in my current role, specifically the Venue and Facility Management class taught by Professor Ed Traversari. I realized that I wanted to pursue venue/facility management while in his class, and many of the principles I learned while in school I am using in my current position." How did you land the position of operations supervisor for the David L. Lawrence Convention Center in Pittsburgh? A few months ago I relocated back to Pittsburgh from Kansas City after working in the sports security industry. The job I had didn’t end up working out. I knew I wanted to get back into venue/facility management in some shape or form, as most of my experience is in venue management, so I decided to come back to Pittsburgh where most of my connections in the industry are. I ended up meeting with Laura Dulaney from Point Park's Career Development Center. Laura told me that she had a few contacts for a position opening at the David L. Lawrence Convention Center/SMG. I applied for the job through Handshake, got an interview and accepted an offer the very next day! How have your SAEM classes helped you in your new role? I believe that my sports, arts and entertainment management classes were very helpful in helping me in my current role, specifically the Venue and Facility Management class taught by Professor Ed Traversari. While in his class, I realized I wanted to pursue a career in the venue/facility management field, and many of the principles I learned while in school I am using in my current position. 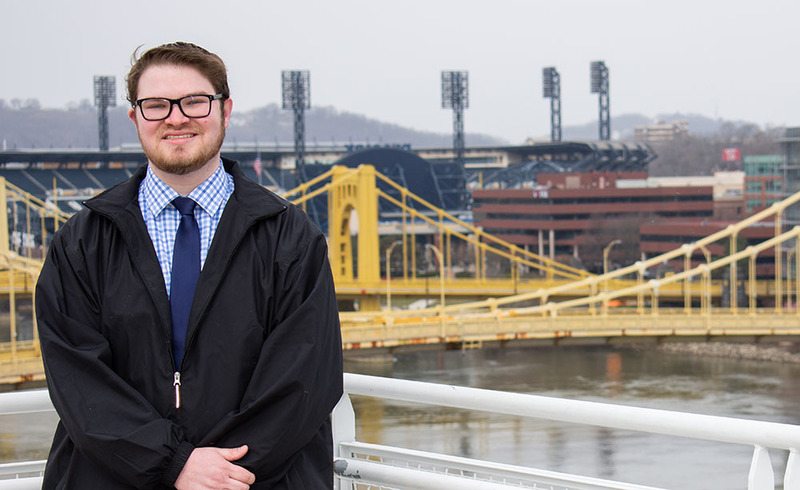 What internships did you have as a Point Park student? What are your favorite memories from Point Park? My favorite memories at Point Park would have to revolve around the Pittsburgh Center for Sports Media and Marketing. Through the Center, I was able gain so many different opportunities in the sports and venue management field. During my junior year, I was one of three students selected to attend the first trip Point Park students made to the Baseball Winter Meetings in San Diego. This trip was a great experience for me, and led to my second internship with the Pirates. Tom McMillan and Mike Fetchko have both been instrumental in my professional success not only while in school, but to this day as well. What’s your advice for students pursuing careers in entertainment management? Be proactive and get involved! Take advantage of every opportunity that comes your way, and try to secure as many internships as possible while in school. I truly believe that my internship experiences made all the difference while looking for a full-time job in this field. Also, never turn down a networking opportunity. The sports, arts, and entertainment industry is absolutely more about who you know than what you know, so don’t take that for granted!